Circle shaped magnets are great promotional tools. These 2.5 inch custom circle shaped magnets 20 mil can be used as refrigerator magnets, shelf magnets, office cabinet magnets etc. 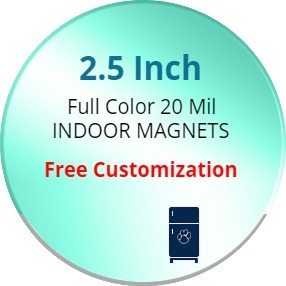 This product is a fully personalized circular magnet. We offer free art setup with all of our products. Magnetic products are ideal for brand promotion, awareness campaigns and spreading messages to a large number of people. Product Size: 2.5 in. x 2.5 in.